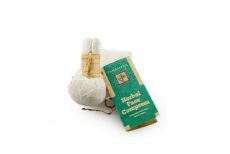 A gentle compress for the face, with combination of Clay, Aloe Vera, Turmeric, Bengal ginger, Wild turmeric, Mangosteen peel, Tamarind leaves, Lilac. Usage of the compress will help prepare the skin to increase absorption of creams and lotions applied on the face. Tanamera’s facial compress improves blood circulation in the treated area; helps nourish, sooth, and revitalize the skin; and acts as a detoxifier. Sprinkle some water on the compress and allow absorption. Steam until the aromas of the essential oil have been stimulated (approximately 10 minutes), and then apply directly to the skin. When the compress starts to cool, repeat the process with the second compress while re-heating the first. Cook for 10-15 minutes to release the beneficial alkaloids in the herbs. Then frozen or iced for 15-20 minutes prior to the therapy. Cold compresses help to reduce swelling and pain and can promote dissipation of pooled stagnant energy due to broken sen lines.